This week's guest editor is Alice Waters, the visionary behind Chez Panisse and The Edible Schoolyard Project. All week, she'll be sharing recipes from her latest cookbook, The Art of Simple Food II, answering our questions, and inspiring us to get a little dirt on our sleeves. 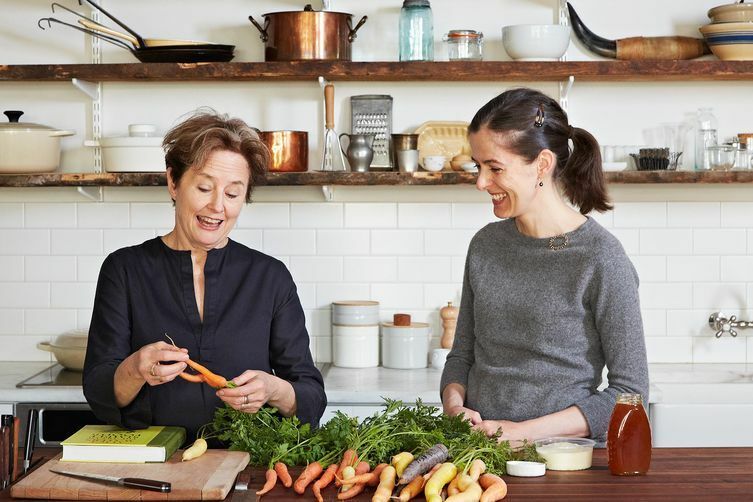 Today: Alice Waters shares a recipe for Colorful Carrots with Butter and Honey, which she recently stopped by our office to cook with us. (It was fun.) 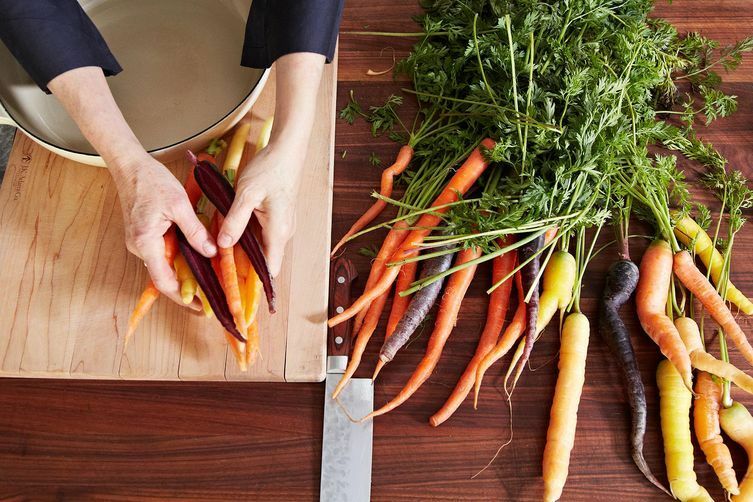 Read on for her carrot-cooking tips, and enter to win your own copy of The Art of Simple Food II! This is a simple recipe, and like all simple recipes, it requires the best ingredients. Most important of all are the carrots. 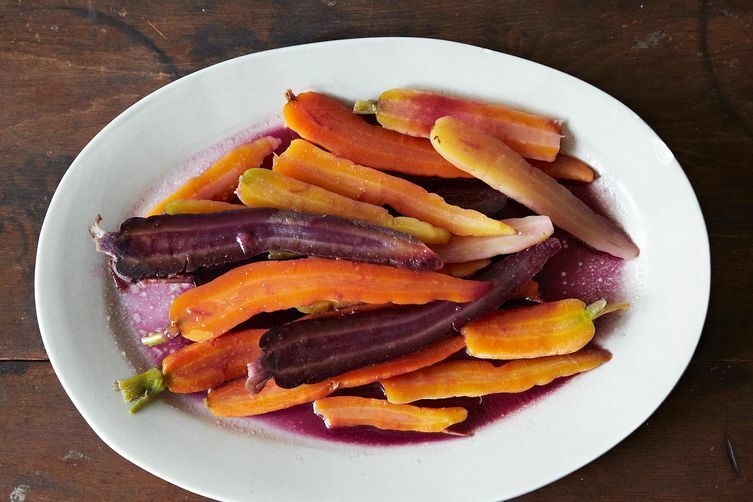 Choose young carrots, vibrantly fresh and alive, in as many colors as possible -- red, orange, yellow, and purple. I often peel mine if they're a bit hairy, or they seem old; but tiny, young carrots can be cooked as they are. 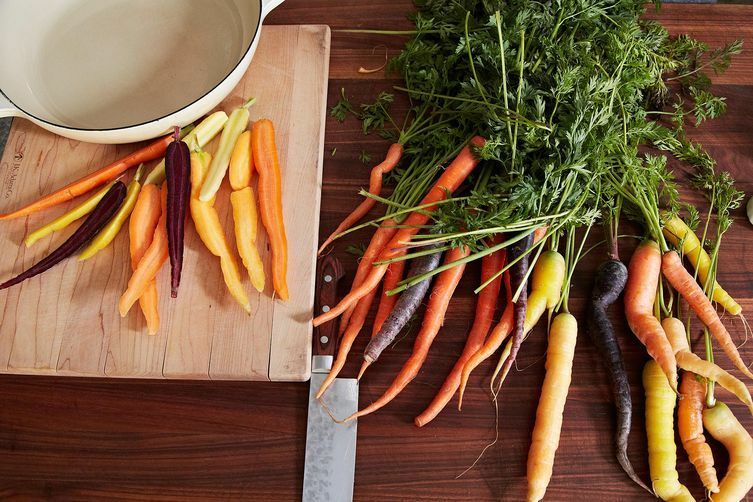 Cut off the greens of the carrots, leaving a half inch of stem; peel the carrots lightly, and wash them well. Cut the large ones in half lengthwise, but leave small ones whole. Put a pan with 1/2 inch of water in it over high heat. Add the carrots, a small knob of butter per person, and salt to taste. Cover the pan and cook until the carrots are just tender. 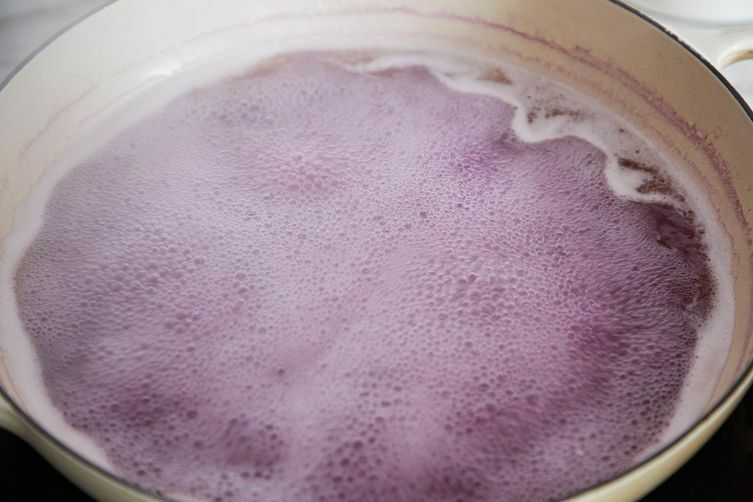 Fun fact: Purple carrots make for purple water! Remove from the pan and serve right away. Were giving away a copy of The Art of Simple Food II! 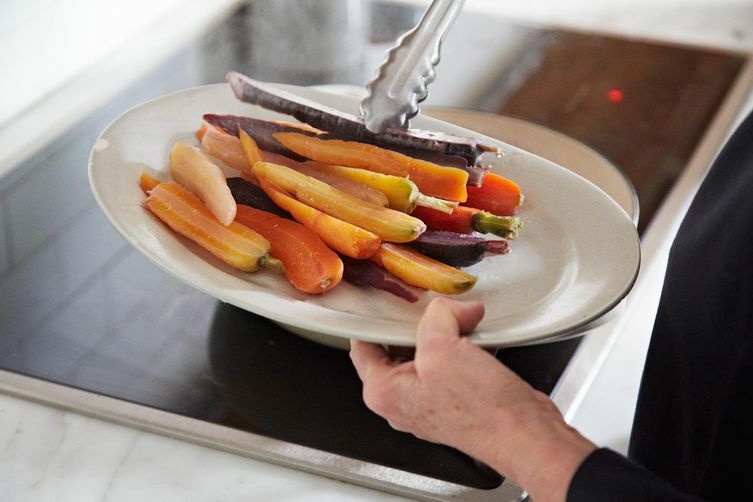 To enter, tell us in the comments: What's your favorite way to prepare carrots? We'll choose a winner at random this Friday, November 22 -- unfortunately, we can't ship outside the US. Carrots Marsala. 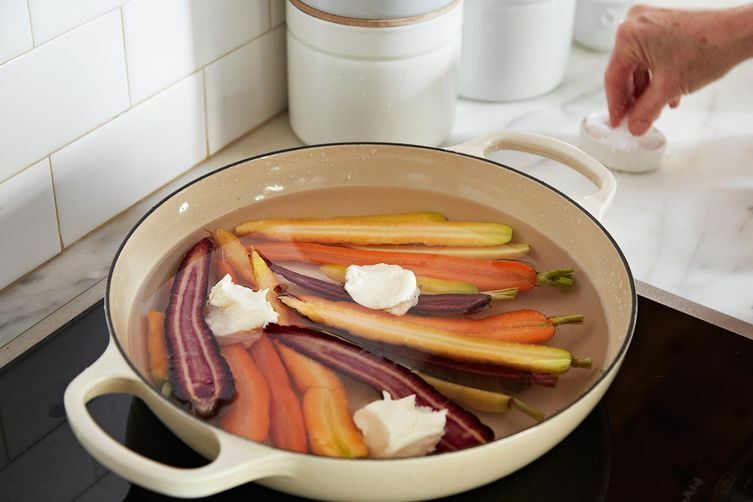 Pretty simple recipe with only a few basic ingredients: butter, salt, marsala and carrots. Soup! With warm spices! Pureed! Julia Child's glazed carrots are my favorite so far. I make 5 pounds for Thanksgiving and Christmas. This looks a bit simpler! I like to pan cook with a little orange juice, butter and cinnamon. Sprinkle of toasted sliced almonds at the end. Roasted with equal parts harissa and maple syrup, a pinch of chili flakes and salt and pepper. Use young carrots or cut older ones lengthwise. roast about 30 minutes at 420. I love to make pickled carrots. I have a recipe from my childhood Better Homes and Gardens cookbook that I still love, sliced carrots cooked in a glaze of honey, butter, and orange juice. I enjoy them made similarly to this recipe, except I slice the carrots at an angle (about 1/2 thick), and braise them with chicken broth (a little bit less than the amount of water called for in this recipe), a few knobs of butter, and a bit of salt. Like this recipe, I cover and bring to a boil, then lower the temp to a slow simmer. When the chicken broth is almost gone and the carrots are soft (but not at all mushy!!! ), I add slivers of lemon peel -- from about 1/2 lemon, and a few grinds of pepper. Then I add about 2 tablespoons of chopped parsley. I get compliments on this every time I serve it. People love the combination of lemon and carrot, and the silky butter. I like them almost any way but I love roasted vegetables coated lightly with olive oil and a sprinkle of s & p. Carrots taste great this way. 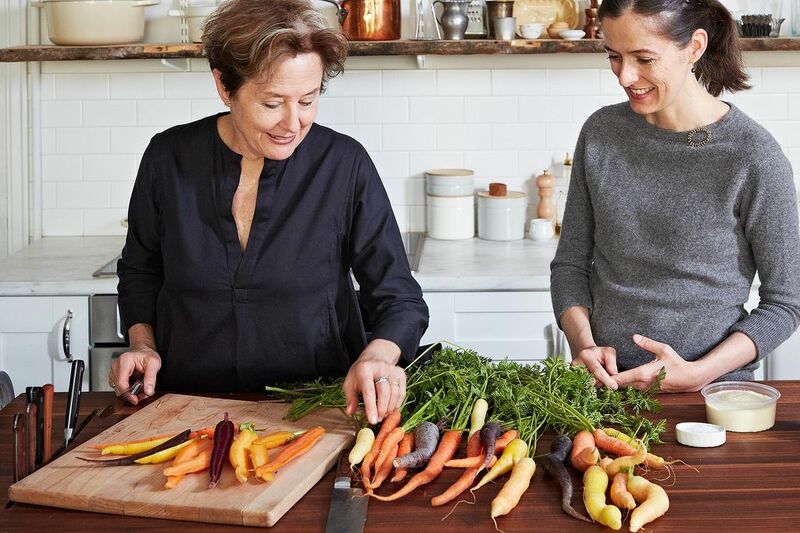 seriously jealous you had the opportunity to cook with Alice Waters. She is my hero! I usually roast them but the above recipe could become a new fave! Roasted with a bit of olive oil, salt and pepper! I shred carrots and hide them in everything-pasta sauce, sandwiches, baked goods so my kiddos benefit from the extra nutrients. I like to roast them with parsnips and turnips with parsley salt pepper and sometimes brown sugar. also like them raw. Just pull them out the ground and rinse. I love to make and eat picketed carrots. I like to toss them after par boiling with just a little brown sugar and butter and roast them the rest of the way.